I always knew I'd be part of a starship crew. I didn't think I'd get the opportunity so soon, but last weekend at the PAX formerly known as Prime I got my hands on Star Trek Bridge Crew. While I didn't get to play with my preferred crew (Ssalarn, Wesley and Steve) I still had a great time and am really excited to pick up the full game whenever we finally snag a VR headset. Who would have thought that I wasn't the only Trekkie drooling over the opportunity to play?! The line formed early, and my first couple attempts to get to the game met with failure. But like a stubborn Starfleet cadet, I kept coming back until I managed a spot before they capped the line. My new crew mates and I took our places at various stations. I took the Tactical console, because who doesn't want to be the one firing phasers? We took a few moments to acquaint ourselves with the consoles before we were underway. The environment is pretty flashy. It's all based on the new timeline set forth as of the 2012 Star Trek film. We weren't on the Enterprise but rather a new ship called the U.S.S. Aegis. The sound has the typical pings and beeps that you expect from a Star Trek bridge, and the aesthetic is very sleek and smooth. Being able to look around and see my crew mates at their consoles was really neat, especially being able to see when they moved their hands to different parts of the console or raised them in excitement. We dropped out of warp in a sector with a station that needed to be evacuated. There was something mentioned about the nearby star going haywire, but I was too busy looking at all my shiny shiny weapons to really catch it all. We had to maneuver the ship close to the station and in true Star Trek form, had to lower our shields to get a proper transporter lock. I'll admit, I got a bit distracted by the environment. 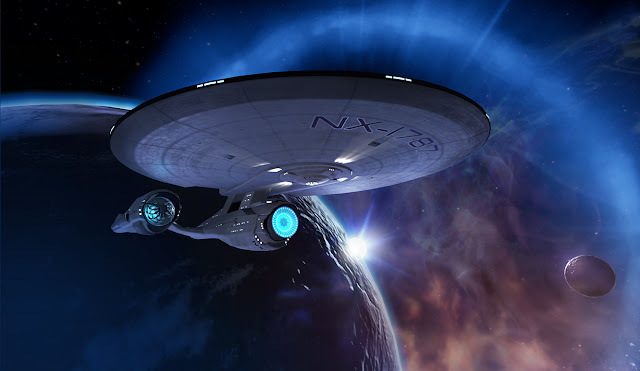 This game really is like a dream come true for Trekkies. Plus, I had very little to do besides raising and lowering the shields. That is until the Klingon's showed up. Why do they always show up to harass the federation in matters that have nothing to do with them?! We traded some fire back and forth, still trying to get clear enough to continue our rescue efforts. I had to coordinate with our helm officer to keep the Klingons in my firing arcs, a task he seemed to find a bit difficult, because more than once he turned the ship the entirely wrong direction. Finally we got the last of the survivors off the station and booked it out of there as quickly as possible before the Klingons could get any more shots in. I had a really great time with Bridge Crew and can't wait to try the full game, which I hear will have a full campaign and a single player mode.